Debate: Will The GOP Die If It Doesn't Seize The Center? Following the GOP's losses in the 2012 elections, there has been a lot of hand-wringing about what the party should do next. David Brooks, Laura Ingraham, Mickey Edwards and Ralph Reed take on the Republicans' future in the latest Intelligence Squared U.S. debate. Debate: Will The GOP Die If It Doesn't Seize The Center? 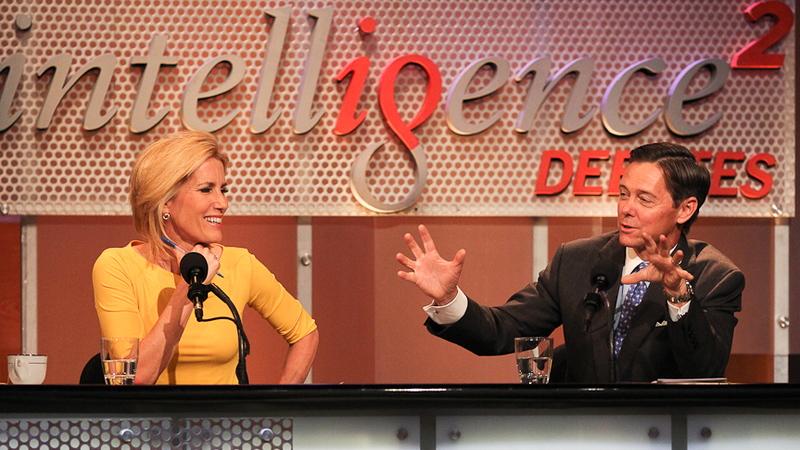 Laura Ingraham and Ralph Reed argue against the motion "The GOP Must Seize the Center or Die" in an Intelligence Squared U.S. debate. Following the Republican Party's losses in the 2012 elections, there has been a lot of hand-wringing about what the party should do to improve its electoral fortunes. Some argue that the GOP should moderate its positions on social issues, as well as policies that affect income inequality and social mobility, and that it should embrace compromise as a way to attract more voters. But others say that changing its positions risks alienating the core Republican base and diluting the party's conservative message — doing more damage in the end. That hot topic was the subject of the latest Intelligence Squared U.S. debate, which pitted moderate New York Times columnist David Brooks and former U.S. Rep. Mickey Edwards against conservative talk radio host Laura Ingraham and Ralph Reed of the Faith & Freedom Coalition. The motion of the Oxford-style debate was: "The GOP Must Seize the Center or Die." Before the debate, the audience voted 65 percent in favor of the motion and 14 percent against, with 21 percent undecided. After the debate, 65 percent remained in favor of the idea that the GOP should seize the center, but 28 percent were opposed — meaning the side arguing against seizing the center changed more minds and won the debate. 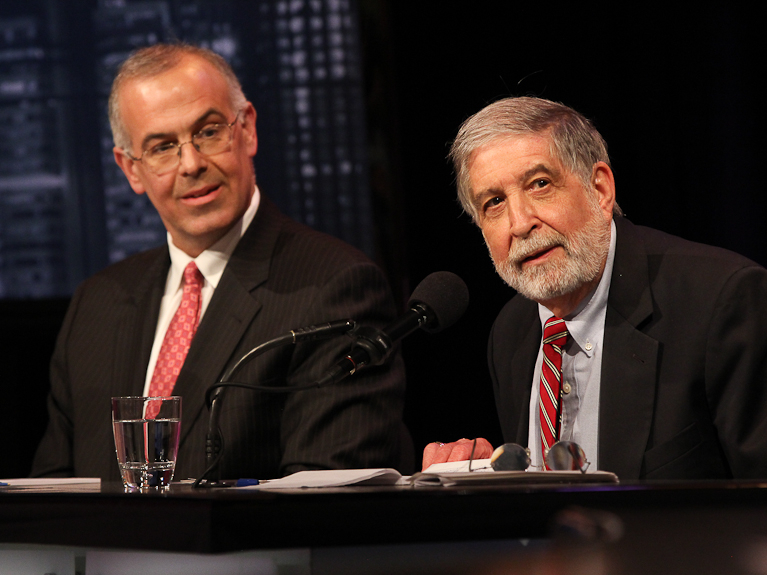 David Brooks (left) and Mickey Edwards argue in favor of the Republican Party seizing the center in an Intelligence Squared U.S. debate. David Brooks became an op-ed columnist for The New York Times in September 2003. He has been a senior editor at The Weekly Standard and a contributing editor at Newsweek and The Atlantic Monthly, and he is currently a commentator on the PBS NewsHour. He is the author of Bobos in Paradise: The New Upper Class and How They Got There (2001) and On Paradise Drive: How We Live Now (And Always Have) in the Future Tense (2005), both published by Simon & Schuster. Mickey Edwards, a former Republican representative from Oklahoma, is vice president of the Aspen Institute and the director of its public leadership program. After 16 years in Congress (1977-92) as a member of the House Republican leadership, Edwards spent 16 years teaching at Harvard, Georgetown and Princeton. In addition to serving as the national chairman of the American Conservative Union, he was one of three founding trustees of the Heritage Foundation and the chairman of task forces for the Council on Foreign Relations and the Brookings Institution. A weekly columnist for the Los Angeles Times and the Chicago Tribune, Edwards published his most recent book, Reclaiming Conservatism, in 2008. He is currently a director of the Constitution Project and an adviser to the U.S. Department of State. Laura Ingraham is host of talk radio's The Laura Ingraham Show, heard in hundreds of markets from coast to coast. Ingraham is the author of numerous New York Times best-sellers, including Of Thee I Zing, The Obama Diaries, Power to the People and Shut Up & Sing. She is a frequent political and cultural commentator in print and on television, as one of the primary contributors on the Fox News Channel and the permanent substitute host on The O'Reilly Factor. In addition, she is a frequent guest on Today and other shows such as ABC's This Week. Ingraham is a former white-collar defense attorney and Supreme Court law clerk. Ralph Reed is founder and chairman of the Faith & Freedom Coalition. Reed served as a senior adviser to George W. Bush's presidential campaigns in 2000 and 2004 and was chairman of the Southeast region for Bush-Cheney in 2004. As chairman of the Georgia Republican Party, he helped to elect the state's first Republican governor and its third Republican U.S. senator since Reconstruction. Reed is chairman and CEO of Century Strategies, a public relations and public affairs firm. He was executive director of the Christian Coalition from 1989 to 1997. Reed has been named one of the top 10 political newsmakers in the nation by Newsweek, one of the 20 most influential leaders of his generation by Life magazine, and one of the 50 future leaders of America by Time magazine. He is the author and editor of five books, including his latest novel, The Confirmation (2010). Reed serves on the Board of Visitors for the University of Georgia School of Public and International Affairs and on the executive board of the Northeast Georgia Council of the Boy Scouts of America. He is a member of the Advisory Council of SafeHouse, a faith-based organization helping the poor and needy.